Going into the 2017 season, Michael Pineda had one year left on his contract and had an opportunity to earn himself a lot of money with a strong year. Even if he maintained his previous performance, his high strikeout and low walk rates likely would have convinced a team to give him a significant multi-year deal. But unfortunately, his season is the story of what can go wrong, even with his numbers improving. The Yankees have had a wide array of pitchers start their home opener in recent years. You have the aces like Masahiro Tanaka and CC Sabathia. You have the duds who take the ball due to injuries like Carl Pavano. Somewhere in the middle is Pineda. He was coming off a weak start in Tampa Bay and was facing the exact same Rays squad. The Yankees had received almost exclusively mediocre starting pitching through their first six games and their 2-4 record reflected the so-so expectations for the team going into the season. And with all that, Pineda came out and damn near threw a perfect game. He recorded 20 straight outs to start the game before an Evan Longoria double broke things up. Before October, it may have been the loudest Yankee Stadium got this season. The crowd was into Pineda’s game. Really into it. Martha Stewart got into it, too. Clapping for strike three, applauding him after each inning and then handing him a standing ovation after the first hit. It goes without saying, but it was the best Pineda has looked in pinstripes. Even better than the 16 strikeout game against the Orioles. He had supreme command of both his fastball and slider and rode them hard for 7.2 innings. He gave up two hits, but the last one, a Logan Morrison solo home run, effectively knocked him out of the game. The win was the second of seven straight for the Bombers and kicked off a tremendous start to the year for Pineda. While Opening Day was his best outing of the season, it wasn’t unique for Pineda’s start to 2017. It’s easy to forget after he missed the second half, but he was one of their best pitchers for the first two months. Six of his first 10 starts were quality starts. No more than four earned runs in any of the 10 games, three earned or fewer in nine of 10. At the end of May, he had a 3.32 ERA and looked the part of it. He hadn’t allowed more than six hits in an outing since his Apr. 5 game vs. Tampa Bay and had gone six innings or more in eight of his starts. His home run issues were popping up again. He’d allowed long balls in eight of his first 10 outings and gave up six in five May starts. Perhaps part of his success was fool’s gold as nine of his 11 homers were solo shots and other two came with only one man on base. Still, with an elevated strikeout rate and the home run environment around baseball, there was room for optimism that he’d returned to his 2012/2014 form. Things took a turn in June. Pineda allowed five or more runs in four of his final seven starts. Nine homers in that span. His strikeout rate dipped and his walk rate rose. And the hits went way up. Pineda’s first 59.2 IP of the year: 50 hits. Last 36.2: 53. Batters hit .335/.365/.538 off him in that span. Once the calendar had flipped from May, it appeared that hitters were taking the ball off a tee from him. He still somehow beat the AL Champs in Houston, albeit with plenty of hard contact not falling in, while pitching a superb game against Boston. But the Angels, Rangers and Blue Jays got to him in abundance. Pineda’s season came to an end when he allowed five runs (three homers) in three innings against the Blue Jays on July 5. Reports came soon after that he would undergo Tommy John surgery, which ended his season. It’s unclear how much his late-season performance was a result of his elbow injury and how much was worse pitching. Guess we’ll never know, but I bet at least some of it was. It’s tough to maintain consistency with your elbow hurting. Pineda finished his season with a 4.39 ERA, 1.9 home runs per nine and a 4.38 K/BB rate. Basically, a typical Pineda line. But for a second there, it looked like we’d get something different. Hitting free agency right after undergoing Tommy John surgery is never an ideal scenario. Pineda is likely looking for a two-year deal, perhaps with the second year being an option. If he’d continued his first couple months, his always promising peripherals would have led to tens of millions on the free agent market. Some team would have bet on him keeping it up. Instead, he’ll have to settle for a deal worth less than $10 million perhaps. With the Yankees contending in 2018 and looking to get under the luxury tax, Pineda’s time with the Yankees is almost certainly over. Assuming he doesn’t return (or go back to Seattle), all four players in the Michael Pineda-Jesus Montero deal will no longer be in the Yankees or Mariners systems. What a strange ride it’s been since that trade. According to Buster Olney, teams have been informed the qualifying offer will be worth approximately $18M this offseason, possibly $18.1M. In that range. The qualifying offer is a one-year deal set at the average of the top 125 salaries in baseball. Make a free agent the qualifying offer, and you get a draft pick when he leaves. Simple as that. That’s it. Pineda blew out his elbow earlier this month and needed Tommy John surgery, and since he’s going to spend just about all of next season rehabbing, there’s no reason to make him the qualifying offer. Right now Pineda is looking at a little one or two-year “rehab and prove yourself” contract a la Nathan Eovaldi last year. He’d accept the qualifying offer in a heartbeat. I’m not sure the Yankees would have made Pineda the qualifying offer even before his elbow game out. The Yankees could very well have interest in retaining Sabathia beyond this season, though not at an $18M salary. Bartolo Colon signed a one-year deal worth $12.5M last winter. That’s probably Sabathia’s price range. Not $18M. Holliday is on a one-year deal worth $13M this year. Make him the qualifying offer and he’d take it. Frazier and any other rental the Yankees bring aboard isn’t eligible for the qualifying offer. All pretty simple, right? Right. That all said, the Yankees do have one qualifying offer candidate this year: Masahiro Tanaka. If he opts out after the season, the Yankees could and should make him the qualifying offer. Tanaka would be walking away from three years and $67M by opting out. He’s not going to accept a one-year deal worth $18M. And you know what? Even if he did take the qualifying offer for some weird reason, good! I’d take him back on a one-year deal in a heartbeat. Sign a qualified free agent: Forfeit second and fifth highest draft picks, plus $1M in international bonus money. Lose a qualified free agent: Receive a compensation draft pick after the fourth round. It’s pretty straightforward for the Yankees because they’re going to pay luxury tax this year. Things are much more complicated for teams that do not pay luxury tax. That’s where the Yankees hope to be next season, under the luxury tax threshold. So, if Tanaka does opt-out and reject the qualifying offer, the Yankees would get a dinky draft pick after the fourth round. Not much, but better than nothing. Monday: Pineda will indeed have Tommy John surgery, the Yankees announced. He was examined today by Reds team doctor Dr. Timothy Kremchek, who agreed with the initial diagnosis and recommended surgery. Pineda will go under the knife tomorrow. Kremchek will perform the procedure in Cincinnati. Friday: The rotation situation just got a little more dire. Brian Cashman announced this morning that Michael Pineda has a partially torn ulnar collateral ligament in his elbow and Tommy John surgery has been recommended. He is going for a second opinion, which every pitcher does in this situation. Either way, Pineda’s season figures to be over. This is the second straight year the Yankees have lost a starting pitcher to a blown out elbow in the second half. Last year Nathan Eovaldi shredded his elbow in August and needed his second career Tommy John surgery. I suppose the silver lining here is the timing. The Yankees still have time to act before the trade deadline. They didn’t with Eovaldi. Pineda, 28, started his Yankees career with a major injury (shoulder surgery) and seems likely to end it with another major injury (Tommy John surgery). He is due to become a free agent after the season and the timing of this injury is just terrible for him. It’s going to cost him millions. He’s looking at a short-term “rehab and prove yourself” deal now. Since coming over from the Mariners, Pineda has thrown 509 innings with a 4.16 ERA (3.65 FIP) for the Yankees. That includes a 4.39 ERA (4.65 FIP) in 96.1 innings this season. The Yankees came out ahead in the trade because Jesus Montero was so awful for Seattle, though Pineda never did become the top of the rotation force they envisioned. As for the rotation going forward, Cashman said Luis Cessa will make a start next week and Chance Adams is an option as well. I imagine pitching well in Sunday’s doubleheader would buy Bryan Mitchell another shot too. Pineda hasn’t been great, but losing pitching is never good. I feel terrible for the guy considering the timing too. We’ll always have those strike ’em outs, Big Mike. Between yesterday’s 16-inning affair and today’s doubleheader, the Yankees and Red Sox are going to play (at least) 34 innings of baseball in about 34 hours this weekend. Pretty crazy that the All-Star break ended three days ago and the pitching staff is already overworked. Baseball can be a real jerk like that sometimes. It is a lovely day for two games in Boston. Nice and sunny with temperatures right around 80. Not a bad day to spend 18 innings at the park. This afternoon’s game will begin shortly after 1pm ET. You’ll be able to watch on YES locally and TBS nationally. Enjoy the game. Roster Moves: As expected, the Yankees have reinforced the bullpen for today’s doubleheader. Bryan Mitchell is up as the 26th man, and both Domingo German and Caleb Smith have been called up as well. Jonathan Holder and Ben Heller have been sent down. Joe Girardi said they might make more moves between games depending how things go. Neither Holder nor Heller deserve to be sent down after last night’s performances, but that’s the way it goes with young relievers. Michael Pineda (elbow) was transferred to the 60-day DL to clear a 40-man roster spot for Smith, who will be the 12th player to make his MLB debut with the Yankees this season whenever he gets into a game. Welcome to the first day of the rest of the season. The All-Star break is over and we’re officially into the dog days of summer. The Yankees begin a four-game set with the Red Sox in Fenway Park tonight. Best case scenario is they leave this series with a half-game lead in the AL East. Worst case scenario is they leave 7.5 games back. A few too many things have been playing out to the worst case scenario for my liking lately. It is cloudy, cool, and humid in Boston this evening. There is rain in the forecast, though not until later tonight. It shouldn’t be a problem unless the game goes to extra innings or something. Tonight’s game will begin at 7:10pm ET and you can watch on YES locally and MLB Network nationally. Enjoy the game. Injury Updates: In case you missed it earlier, Michael Pineda has a partially torn ulnar collateral ligament and Tommy John surgery has been recommended. 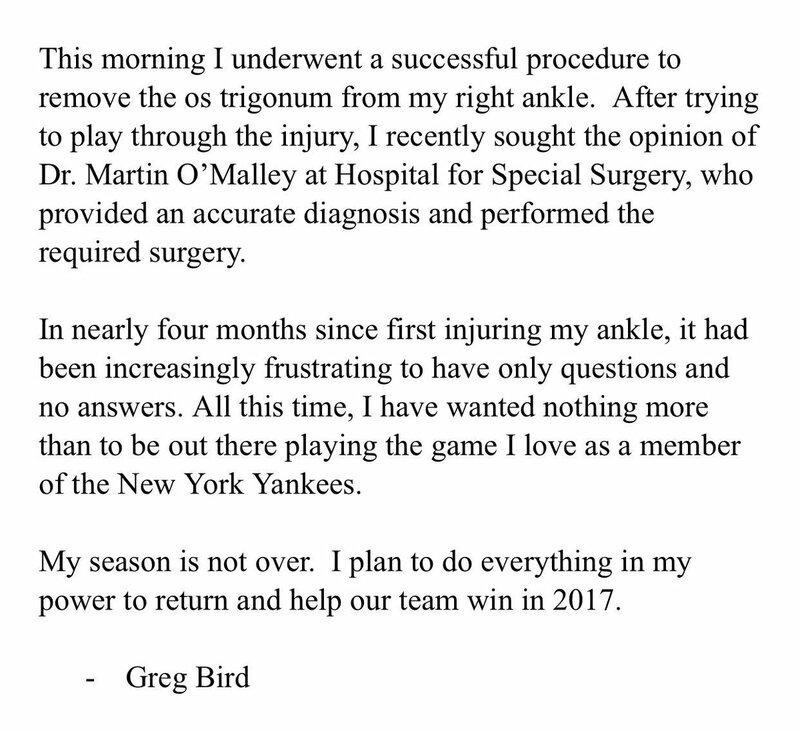 He will get a second opinion first … Greg Bird (ankle) has been diagnosed with inflammation in his os trigonum, which is essentially an extra bone in his ankle. He received another cortisone shot, and if that doesn’t work, he may need surgery. The surgery comes with a 6-8 week rehab timetable, meaning he could be back for September … Starlin Castro (hamstring) will play another minor league rehab game tonight, and could return as soon as tomorrow depending how he feels. Roster Moves: Welcome back, Matt Holliday and Jordan Montgomery. Holliday (illness) was activated off the disabled list and Montgomery was called back up. 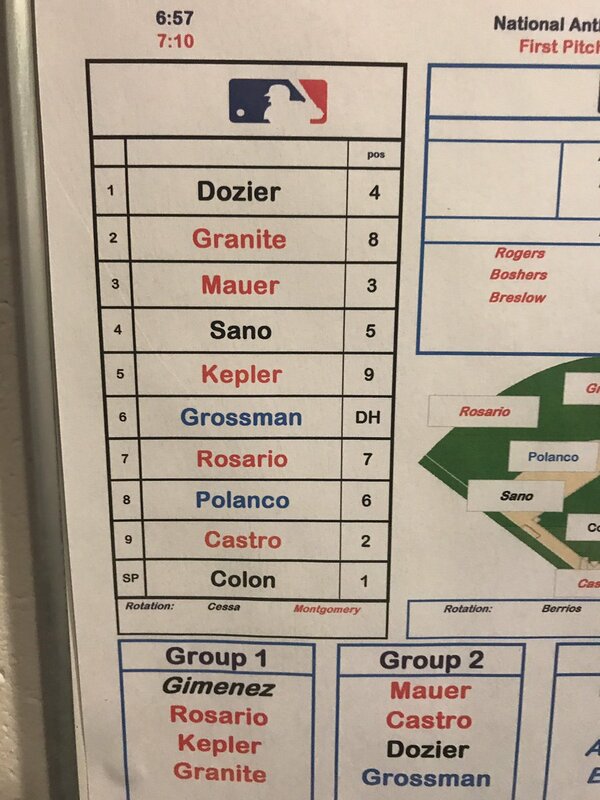 He didn’t even miss a start … Pineda was placed on the 10-day DL, allowing the Montgomery to return before his ten days in the minors were up … Rob Refsnyder was sent down to clear a roster spot for Holliday … welcome to the big leagues, Garrett Cooper. He’s been added to the roster following yesterday’s trade. He essentially takes Tyler Webb’s 25-man and 40-man roster spots. This will be Cooper’s MLB debut. Next time the Yankees need a 40-man spot, they’ll slide Pineda to the 60-day DL.